We hope you will enjoy your visit with us today. Where in our website would you like to go? 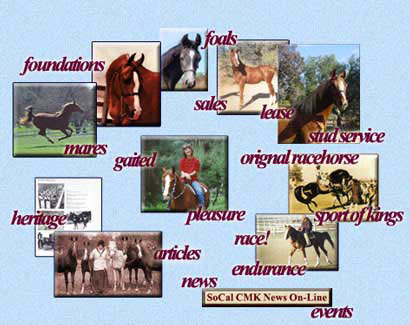 We are constantly expanding and updating our website with postings to the Southern California CMK Heritage Newsletter On-Line with its featured news and events, Nursery News, Classified Ads, and noteworthy articles from the CMK Heritage breeders, friends, and advocates here in Southern California. Please check in with us often to see what's happening in our area. We also continually strive to add new information and photographs on the pedigrees and note pages of the horses of Arieana Arabians. With much gratitude to our friends who have so generously shared their personal information, insights, and experiences, today we proudly add updated information on the stallion Mesaoud and the mare *Nejdme. And so, just as a gentle reminder: If you are a returning visitor, please refresh your cache and update your Bookmarks to receive the greatest benefit of your return visit and to reflect any changes, additions or corrections in our website page titles, page locations, and the pedigree and photo information of our beautiful purebred CMK Heritage bloodstock and goals of our breeding program at Arieana Arabians. We hope you will enjoy your visit and come back again very soon! Nursery News What is CMK? Copyright � 2003-2013. Website designed and maintained by Suzi Morris. All rights reserved. Current as of August 14, 2013.